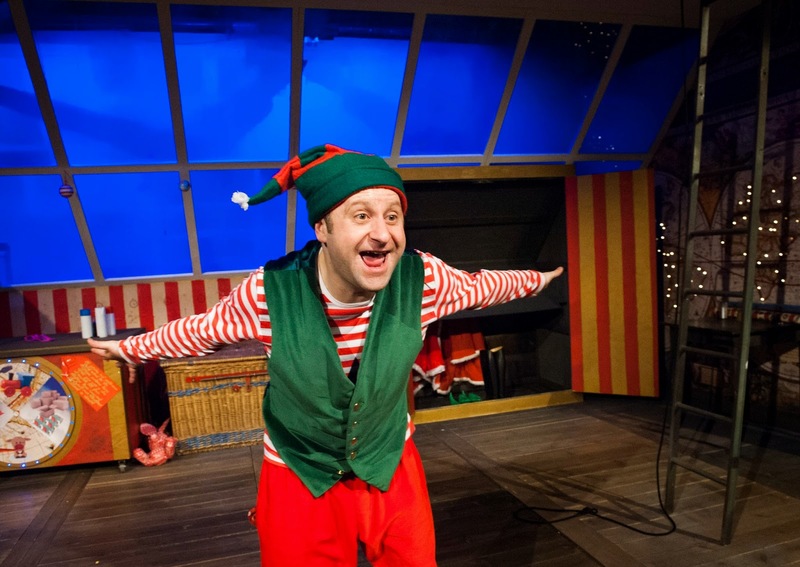 I have spent the last wee while making my show 'Eric the Elf's Chaotic Christmas' for the Citizens Theatre and it finished it run at the end of December. 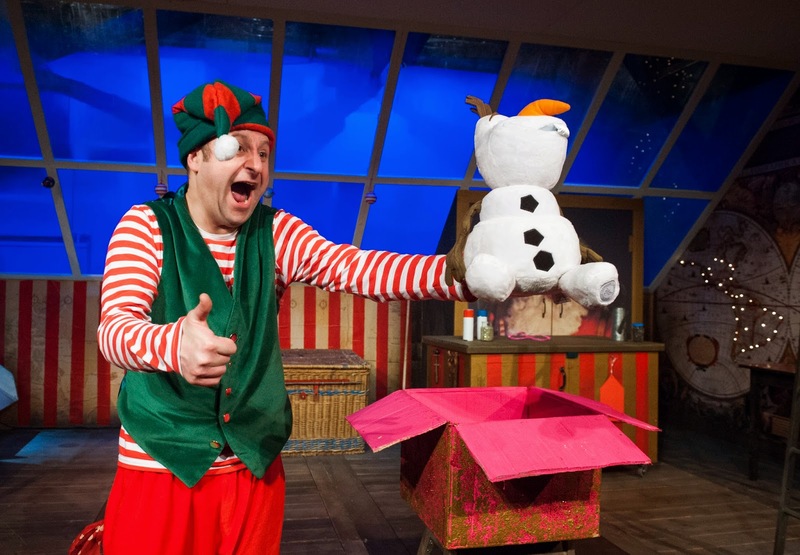 I'm finally getting round to writing a wee bit about the creation of this Christmas show for 3-6 year olds. I was responsible for writing and directing the play as well as composing the music. 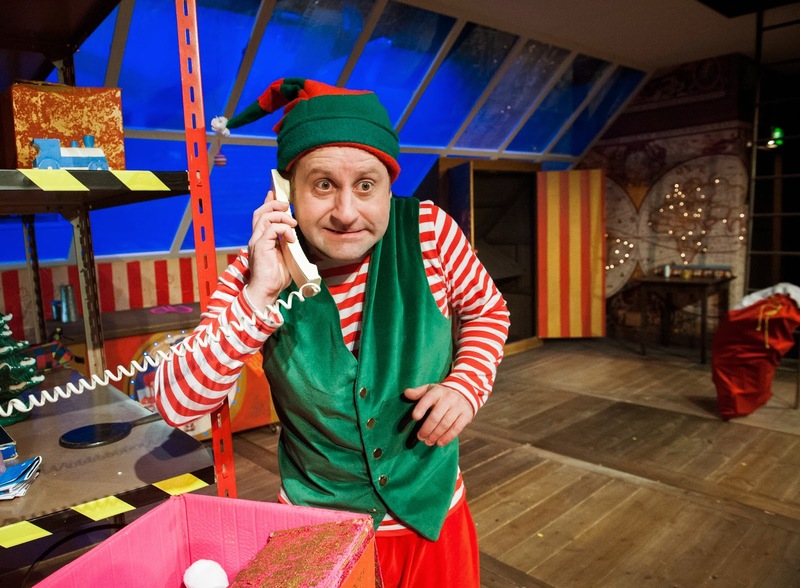 I have made scores of plays with young people and I was composer and assistant director for Bauble Trouble in the same space last year, but this was my first time making a show from scratch for this age group. I thought it may be of interest to write about it's creation, both to visitors to this blog (I checked and it's had 23 odd thousand views... which is a surprising and also slightly terrifying statistic) and to the future me. The first thing was to create a treatment (you can have a look at that here). This was a page that basically outlined my story. I am always aware that the story will change in it's detail but the overall arch has to be strong at this stage, otherwise it's going to be an uphill battle! I am very keen on collaboration (as, I think, most theatre folks are) so I sent the treatment off to both Harry Ward who was going to be playing Eric and my colleague Marianne Yeomans, whom I have set up and run youth theatres with for over a decade. 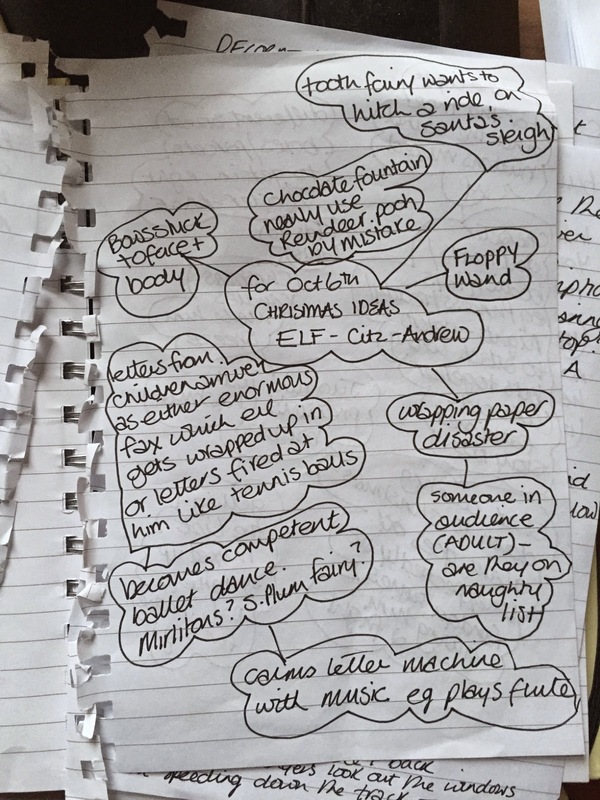 We then organised a development session where we could start to look at some of the ideas I had, what worked, what seemed like a bit of a cop out and what was just an old fashioned rotten idea! I remember reading a book back when I was a student, it's title has now eluded me I'm afraid, that talked about writing for children and there was one particular rule that was discussed that was always at the forefront of my mind as I made this show (and actually I think this rule is just good writing for any age, but is absolutely a point children will call you out on). It was about the rules of the world. If your play is in a world where people can click their fingers and lightning fires out of them, then that's fine. If, in that same world, people say a magic word and disappear, then that is also fine. However if, after watching the story and the world for an hour or so, one character who is stuck in an impossible situation all of a sudden announces "lucky I can fly" when this has not been an accepted part of the world until up to this point, then that is not ok, And believe me, children will let you know that that is not ok! So your world can be whatever you want it to be, but once you make up the rules you must stick to them, and everything that happens must make logical sense within the confines of those rules. We fell foul of this a couple of times along the way, children would shout at us that things didn't quite add up, and we were glad for the feedback and worked on it until they shouted no more! But it was a valuable lesson then, when I first read it, and it's a valuable lesson now. Marianne had brought a whole bunch of great ideas to the development session and it was really invigorating to go through some of my ideas and have them questioned whilst also listening to new ideas. Here are a few photos of the kind of material that was brought into the room - riffing off of my initial treatment - and some stuff that was generated once we were all together. Our thinking was to have as many ideas as possible. Marianne had a great suggestion about finding clues, this wasn't in my initial treatment, but seemed like something that could glue all our various 'sketches' together. 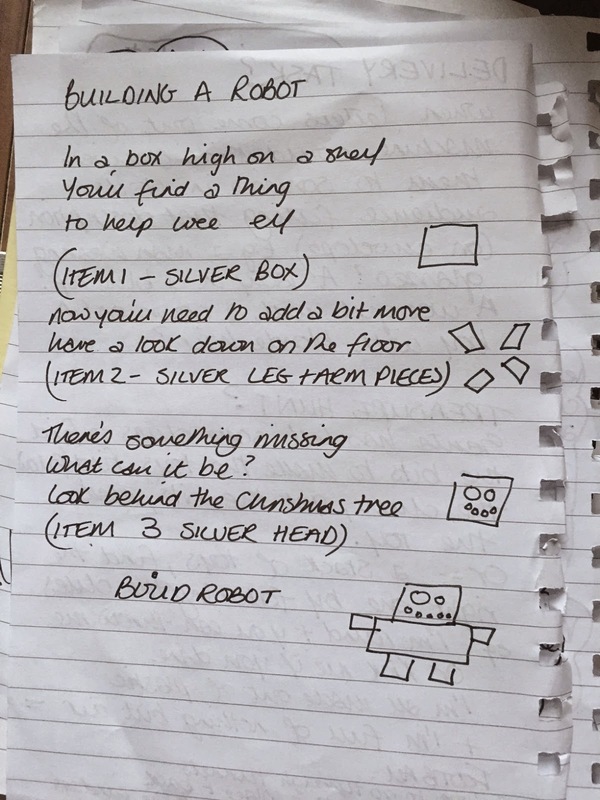 There was also an idea about Eric having to find three different parts of a robot and building the machine. 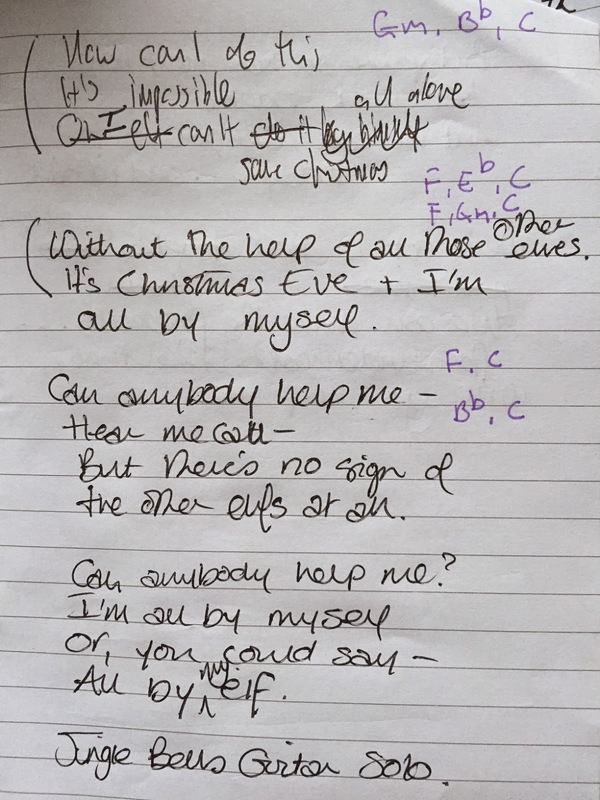 We also knew that there would be songs throughout the show, so we found where we thought these would fit into the show and, guitar in hand, I started to write down some lyrics with the others throwing ideas at me. So by the end of a very productive day I had this document here where I have the scene and a basic breakdown of what happens in it. It's a combination of snippets of dialogue, song titles in bold and other details that came up, for example in the reindeer section I have a link to a video for the particular kind of puppet that Harry recommended that he just so happened to have a lot of experience of operating, happy accidents like this are why I feel keeping the process so open and collaborative is extremely advantageous. 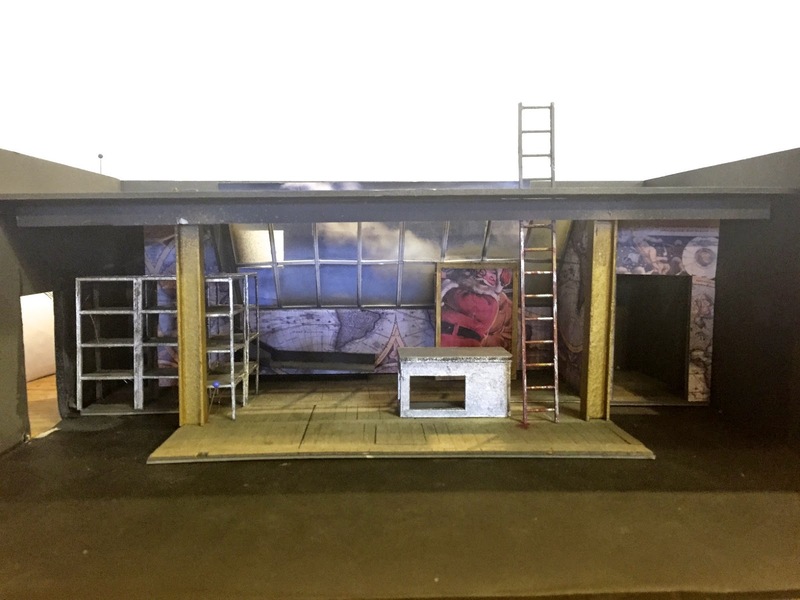 I sent the more detailed plan to Neil Haynes, our designer, and he then arranged to have a meeting for him to show me the model that he had made of the set. I was really excited when I saw the model. The circle studio at the Citz had just recently been refurbished with all the seating ripped out, so this model was taking full advantage of the new space. 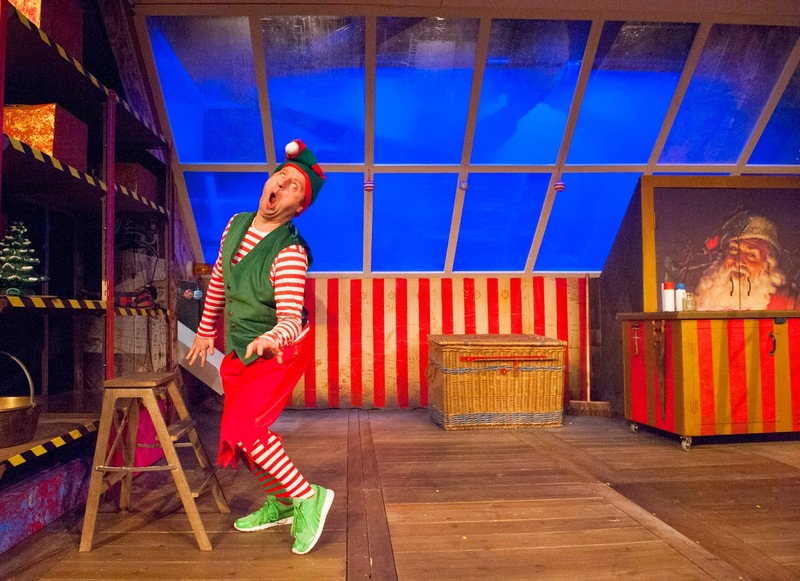 It was a little bit different, didn't feel tacky christmas or too 'kids theatre' yet also had a sense of magic. There was a ladder leading up through the roof and the only real change I made from this was in the end the ladder was rotated so it was flat to the audience. I had set aside a couple of weeks prior to rehearsal for me to work on the script and to have as much of the music composed as possible, so that when I got in the room with Harry we could focus on getting the show rehearsed rather than waiting for me to come up with stuff. The show was to last for about 45 minutes and there was pretty much sound throughout the whole thing. That's a lot of writing and working out what kind of particular sounds are required for certain routines. 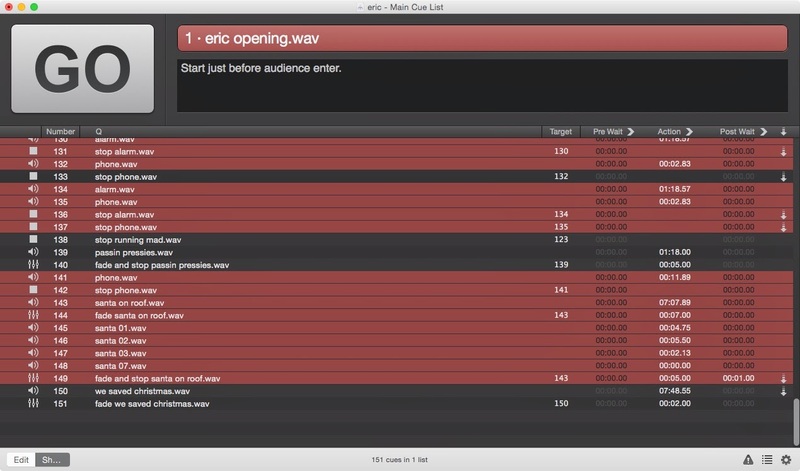 Here's a bit of rehearsal footage that will show you what I mean. I also knew that there were certain sections where we had written down good ideas but I wasn't sure exactly how doable they would be. The above, where Eric has sellotaped a ball to his head, is a perfect example. Would it be possible to sellotape a toy to your face? Only one way to find out. The answer is yes! In rehearsal we found that it wasn't quite as simple as it seemed. A certain kind of sellotape worked (other kinds snapped too easily), on a certain kind of hat and Harry had to make sure he was as sweat free as possible - which is hard when you've been running about under lights for 25 minutes... so something that looks extremely silly and happens so quickly actually takes quite a lot of thought and preparation to get right! And that really is what rehearsal was all about. It was about taking all the ideas we had generated and starting to realise them. Early on we realised the show was going to be way too long. We had a section where Eric built a robot and then built a rocking horse - getting the head and the tail all mixed up and stuff ... but it was just a little dull and repetitive and we couldn't find a suitable rocking horse. So we took these different ideas and changed them into one that worked very well. Eric tries to build Olaf the snowman from Frozen, but he has some difficulty and gets his Disney characters all mixed up. So it's Olaf's body but with Minnie's head and Tigger's feet, that kind of thing,... it was a bit gory getting the pieces made as it involved cutting up some Disney toys, inserting magnets into the contact areas and then re-sewing, but it was worth it! Stage management work on cutting up Disney characters so Eric can put them together again! Eric finally got all the bits in the right place! We had a number of people we trusted drop into the room during rehearsals. They would offer advice, usually focusing on their area of expertise and it was my job to listen with an open mind and decide what notes I wanted to pursue and what notes I was happy to hear but also happy to pass on. We came up with a number of really nice little bits and pieces that evolved from ideas that those we invited had suggested, so it was absolutely worth it. Having an outside eye was also very useful as it was just the two of us in a room with a load of props, so the feedback from others gave us encouragement that we were on the right path. As the rehearsals progressed and the show started to form we knew it was too long - almost an hour - and that was when we had to 'kill our babies'. Ideas that we knew were good and would be nice to watch but, when it got down to the story we were trying to tell, just didn't quite cut the mustard. We had rewrite after rewrite (thankfully it was a very short script) until we were happy. We had a lot of props to play around with! A quick note on the writing. I had come into rehearsal with a first draft of the script and probably about 2% of that survived into the final show we presented! Sometimes Harry would ad-lib scenes and I would capture and finesse the best bits, sometimes we would sit round a table and bash bits out together and sometimes, if it was a major change, I would go home and come in with a re-write the next day (or send it to Harry via email if it was a weekend). There were certain sections where we had no idea what would happen as they involved audience members taking part, but we did our best to come up with ideas for many different paths that the conversation could take. As this was a one man show, my thinking was that the sound and the lights would act as one character - hence the number of sound and lighting cues punctuating the piece and that the audience would act as another. It's quite a tricky balance of having a show that is so hinged on the the technical but is also free enough to accommodate the audience interaction. Our technical rehearsals were slow and detailed, as they needed to be, and I really believe that this attention to both sounds and lights working in harmony with the actor is what makes a theatrical presentation so enthralling. The most interesting part of the process for me was when we put it in front of an audience of children for the first time. We had a great bunch of Primary 2s (6-7 year olds) come and see our first dress rehearsal. They surprised both Harry and I with their ability to see ahead - for example Harry is singing the 'All By My Elf' song about being on his own, and the kids were screaming "WE'RE HERE!!! WE'LL HELP YOU!!!" We hadn't planned for this (Eric was supposed to realise that the kids could help him after the song) so Harry had to be selectively deaf for that first performance, but we then worked on it in rehearsal and came up with some short lines and gestures that he could make that would show the children that he heard them but their plan wasn't going to work...yet. Another point was that we had a magical hamper that wrapped presents. Eric puts all the unwrapped presents in there and, looking in the hamper, he shouts "all wrapped". This was fine, it fitted in with the rules of the world and it wasn't questioned. 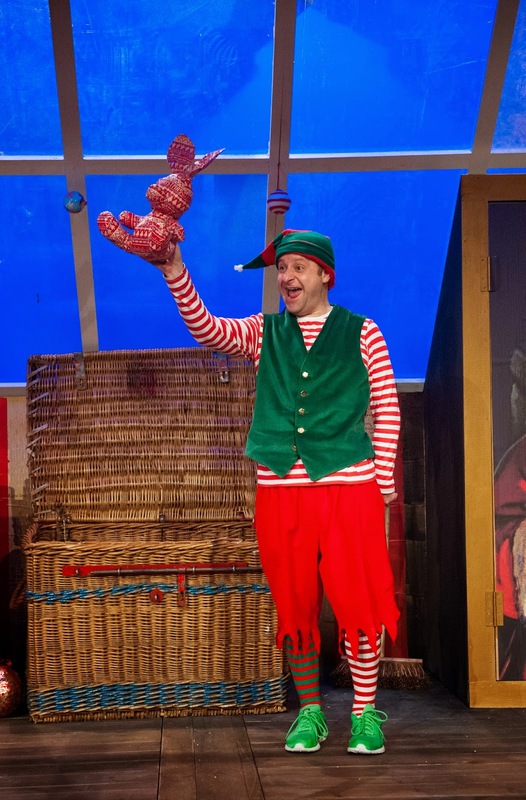 Much later, at the end of the play, Eric opened up a cupboard to find lots of other presents, the audience then help him put them into Santa's sack. We thought this was fine and all made sense. But then the Primary kids started shouting as Eric stated "that's all the presents in the sack" - "IN THE HAMPER, THERE ARE PRESENTS IN THE HAMPER!" And of course they were right. We had said there were presents in the hamper about 20 minutes ago and we were packing up presents from the cupboard and then saying that was all the presents. This was a tiny wee bit of logic that was easily solved (we added a line in that suggested the presents from the hamper had been wooshed into the cupboard and they were the same presents) and wasn't questioned after this little change, but it highlighted how logic and obeying the rules of the world really mattered to the children. It was really interesting working on this show as it was so interactive it drastically changed in feel and, sometimes, in content from performance to performance. Having school groups in was very different to having nursery groups in, and then having families come along was different again, and there was a different feeling in the room before and after Christmas. Sometimes kids would be jumping up to help Eric, other times they were more reticent, sometimes the adults would be singing louder than the kids, sometimes the adults were clearly exhausted and/or hung-over and left it all up to the children. Watching Harry adapt his performance was really interesting, but it was clear to see that the rigorous work we put into testing every part of the show and making sure it was funny and detailed but also flexible if the audience didn't react in the way we anticipated, paid off in the end. But of course the true joy in these kinds of plays comes from seeing tiny wee people having a whale of a time! And I love watching beaming grandparents watching their little grandchildren rolling about laughing and shouting instructions to Eric. It is a very rewarding experience. Nothing makes me more angry when it is suggested to me that it's "just a kid's show" in an offhand way, like all you need to do to make something good is some stupid clowning and that's fine. Children deserve the same quality of theatre that adults do, and achieving that quality is not easy. It requires imagination and an actor who is willing to put themselves well out of comfort zones (it's not often in theatre for grown-ups that the audience will shout at you when something doesn't make sense!) and just as much dramaturgy and thought as ANY piece of drama! I hope you enjoyed my little breakdown of the creation of Eric the Elf. My next project is Love 2.0, which will be going out on tour around Scotland in March, so I'll be writing about that too very soon.